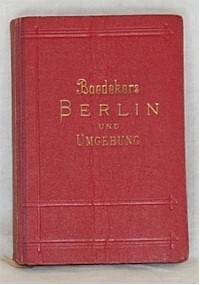 All Baedeker editions on Berlin. Before 1878, Berlin was included in the editions on Mittel- und Nord-Deutschland. Note that, although only editions in German and English are covered on this site, there were also two special editions in French, published in 1885 and 1908. However, as they are listed by Hinrichsen as "S" or special editions, they are not dealt with here. It is interesting to see how the title changed from "Berlin und Umgebungen" to "Berlin und Umgebung" (environs in plural and singular respectively). Note also the "kleine Ausgabe" of Berlin und Potsdam; it was a paperback version of the main guide.